Noelle Stevenson has left a big cultural footprint for someone years away from her 30th birthday. You might know her as Gingerhaze, her online handle, under which she first posted her viral hipster Lord of the Rings fanart, or you might know her as a co-developer of BOOM! Studios' popular comic series Lumberjanes. You might have seen her credited on issues of Marvel's Thor Annual or Runaways, or maybe you've read her Eisner Award-winning fantasy webcomic-turned-graphic-novel Nimona. The point is: Noelle Stevenson is everywhere, and now she's the creator, producer, and showrunner of Netflix and DreamWorks' She-Ra and the Princesses of Power, a thoroughly modern reboot of Filmation's 1985 animated He-Man TV show that introduces a whole new generation to the land of Etheria, the magical princesses and their Evil Horde enemies, and the honor of Grayskull. 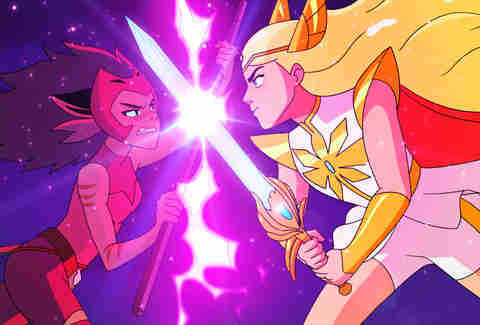 In this version, Horde foot soldier Adora finds herself the newborn avatar of legendary warrior She-Ra -- a warrior who, it turns out, fights for the side she's been trained to fight against. Noelle Stevenson spoke to Thrillist about updating the show for a new era, and how vital it is for young people to see complicated, diverse characters onscreen. First off, this has been on my mind since I saw the first images you released: How did you go about redesigning the iconic costume? 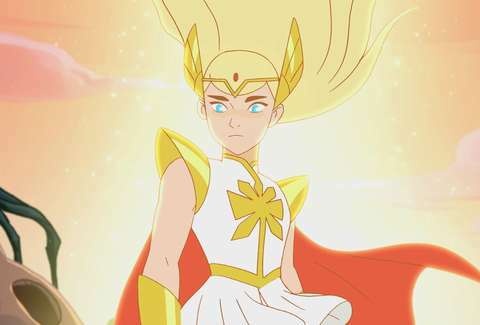 The new She-Ra has a really distinct look that's a bit different from what She-Ra used to be. Noelle Stevenson: Yeah, early on in the process, I reached out to a lot of illustrators who I found inspirational, who were working in animation or in comics, and asked them to do their takes on the characters, push the boundaries and just get really out there in a way that doesn't even have to work for animation. Throw all the ideas that you have out there, and go crazy with it. We got all these really cool, really different designs from this batch of artists, and then we went through, identified the aspects that were interesting or inspiring to us. There were a few people who made choices that were really cool and different, things I hadn't thought about before that changed the way I thought about the characters. One of our artists was the first to draw Catra [Adora's frenemy who spends the series trying to thwart her former sparring partner] a little smaller in stature, whereas in the original, she was this femme fatale who was curvy like all the other characters. And then it was like, oh, wait, what happens when she's this scrawny, scrappy character? That changes the way she is in my head. We're doing a sci-fi fantasy world, but we want it to feel distinct. We want to make choices that feel different from what might be the standard fare. The boots were a big thing. So often in fantasy you end up with the same leather boots, or in sci-fi you end up with more rocket boots. So, how do you find the mix between those two things that also feels fresh and new and distinct to our show? One of our awesome artists did these amazing fantasy magic sci-fi sneaker boots, and that's what I immediately wanted to pursue. Eventually it all comes together into the characters that you see -- after getting weighed in on by a lot of people, especially for such an iconic character -- and then polished and honed until it's animate-able and it feels like something that fits in our world. I love that you mention the boots in particular, and how they're not high heels or anything because these people are warriors, they're at war, they need sensible shoes. Stevenson: Yeah, but that's the thing. Of course you want the clothes to feel like they work. But sometimes "practical" can mean stodgy or uninteresting, and I didn't want to do that either. I still wanted to find the thing that's cool and different. It doesn't have to be practical 100 percent of the time. But also the characters shouldn't look like they're in constant pain because of the outfit that they're wearing. So, it's a line that you have to walk, but I wanted the characters to feel free and like they're expressing their personalities while also just, you know, being relatable. The idea that a kid could wear their sneakers and their shorts to cosplay She-Ra is really exciting to me. I especially love the biker shorts under She-Ra's skirt. I immediately thought, that's genius! Now that we've talked about redesigning it, how much inspiration did you take from the original show? Stevenson: I did a lot of research. The original is a toy property, and so many of these characters started their lives as toys and then were incorporated into the show. That's really how I approached it as well: I treated the characters as distinct figures that I had to build the world around. There is a version of Etheria that already exists, but it's really about just saying to yourself, here's everything I have to work with. You have this sci-fi fortress on one side, and this fairytale forest on the other full of princesses -- how do those things tie together? How do you find the science in the magic and the magic in the science? In what world does this alien warlord belong in the same universe as a superpowered princess riding on a winged unicorn? You just try to figure out what ties the things together, how to find that commonality. Almost everything in the show comes directly from the original in some way or another. Almost all of the characters have their roots in an existing character. There's no shortage of inspiration to be drawn from it. Did you take any influences from other stuff, or other artists to build this world? Stevenson: Yeah, totally. A lot of '70s and '80s sci-fi and fantasy inspired the original show at the time, but then also inspired me. There's a lot of glam rock in there. I'm a huge Star Wars fan, so Star Wars is sort of in everything I do, whether I want it to be there or not. [Laughs.] Also, the world of comics, which is where I got my start, the world of Moebius and Roger Dean. There are a lot of Miyazaki influences in there -- specifically Nausicaa, which has this heightened fantasy sci-fi feel that I found really inspirational. I immediately thought of Nausicaa when I saw the giant bug monster in the first episode! Had you always been a fan of She-Ra? Stevenson: I didn't grow up with She-Ra. I didn't grow up with a lot of TV in general, and also I was born in the '90s, so I sort of missed the whole thing. But it was something that I came to at the start of my animation writing career. I inherited a love of Masters of the Universe [the franchise centered around He-Man from which the original She-Ra eventually spun off] from a lot of the people I was working with. In the first show I wrote for, Wander Over Yonder, we actually have not one but two Masters of the Universe homage episodes. They were helmed by people who had loved these shows growing up, so they were the ones who introduced me to that love. 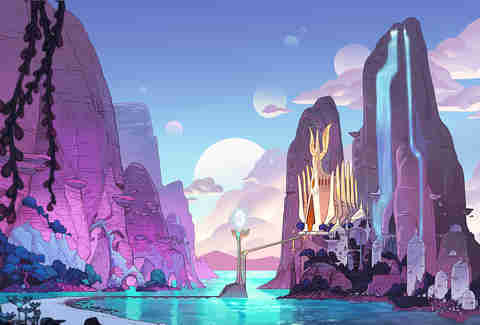 So, that was something that I was already getting into by the time I found out that She-Ra was a property DreamWorks was looking to develop. It just seemed like the perfect time. Stevenson: [Laughs.] Yeah, it is, it's incredibly different. I got this job because I was able to paint an intriguing picture of what She-Ra could be in the new world. With showrunning, you have to do something that's a little bit different than just coming up with ideas, and that's being a leader. Suddenly you're working with a crew of 40-plus people just on my floor here, and even more animators, timers, actors -- every step of the process there are so many people involved. The thing that I had to grow and develop was just being that leader, and bringing the crew together and giving us that clear vision and being a mediator, being someone who can compromise, someone who can collaborate and support my crew and have their voices be heard. I had no idea how to do it when I started out. 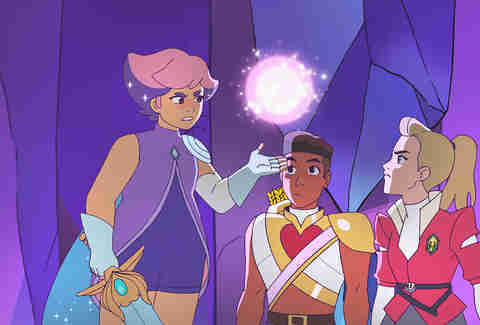 But it's not so different from how the characters in She-Ra are figuring out how to be leaders in their own right. You just stumble through, you have a lot of mistakes, and you just hope that your crew is there for you and can support you and you are there and can support them in return. It's been a huge learning experience. Your work, like your webcomic Nimona, focuses mainly on these very powerful and very complicated women and girls. What draws you to these types of stories? Stevenson: I had always felt a dearth of the types of female characters that I was interested in. I was somebody who, as a kid, really gravitated towards "boy stories." And that's in finger-quotes, although you can't see them. Stevenson: [Laughs.] Stories that featured heavily male casts. But there would be times where I would zero in on one female character and just refuse to let go. Kind of dig my nails in, and she would just become everything to me. They were so rare, and so much of it was just my own imagination of who she was. But it was always something that I really missed. I felt like there was a reluctance to show women as being complicated and being messy. I think that it's been getting a lot better in the last few years, but when I was growing up there wasn't a lot of that. And the protagonists that were deemed acceptable for girls, you didn't usually get to see much of an unlikable side from them. As someone who grew up feeling oftentimes very unlikable, you feel anger, you feel deep sadness, you feel frustration, you don't feel heard sometimes. And all of those feelings are not socially acceptable to express. So how do you have your voice heard? That's where a character like Nimona comes from, who is a very pure culmination of all of these feelings: Why is no one hearing me? Why am I not as strong as I want to be? Why can't I have the love that I think I deserve? They're complicated, messy feelings, and that was something that's so important to me to represent. That's something that we have to see. The idea that kids should only see behavior that they should want to imitate is a little bit flawed. I think we should also see behavior that shows us why we shouldn't imitate it in certain ways. There are emotions that are messy and hard to express, but there are safe ways to express that as long as you're not hurting anybody. Going back to something you said earlier about Catra, and how the suggestion that she could be a smaller-statured character influenced how you thought of her in a different way -- I love how everyone on this show looks different. There's no mold that everyone fits, there are all different types of skin colors, all different types of bodies. Was that something that you expressly set out to do? Stevenson: Absolutely. I think, because the original was a toy property, the characters were designed to fit one of two molds, male or female. And there wasn't a lot of body diversity or racial diversity in the cast. With such a big cast, it's not only my responsibility to show a diverse cast, but it makes the story better. You get characters that are very distinct from each other, and that affects their experience in the world, and that affects their personalities as well. All of those things only make the story richer and more interesting. It was something I knew from the start. And the development executive I was working with -- who had been a huge fan of the original as a kid -- that was something that she expressed as well. She wanted to expand the boundaries of what it meant to be a princess. You don't have to have a wasp waist. You can be almost any type of woman and have magical powers, and your body shape doesn't stop you from doing that. You can be anything, no matter who you are. And of course there's been the usual controversy about it too. Stevenson: I think it's interesting, especially when it comes to characters who are chubbier in our version. I think anybody who observes the world in any capacity will see women of all sizes doing incredible athletic feats. You can find fat ballerinas. You can find incredibly strong women who are fat. All you have to do is look around at the world to see that. And that's so valuable for young people to see, in a show that's also about magic and science fiction, and then you have this wonderful message on top of that. Stevenson: It's incredibly realistic. Why would it be so strange for a princess to be incredibly nimble and lithe and be a fat woman? That is something that I'm very excited to show in this story.